dawson is a serverless web framework for Node.js on AWS (CloudFormation, CloudFront, API Gateway, Lambda). You can use dawson to build and deploy backend code and infrastructure for single-page apps + API, pure APIs or server-rendered pages. 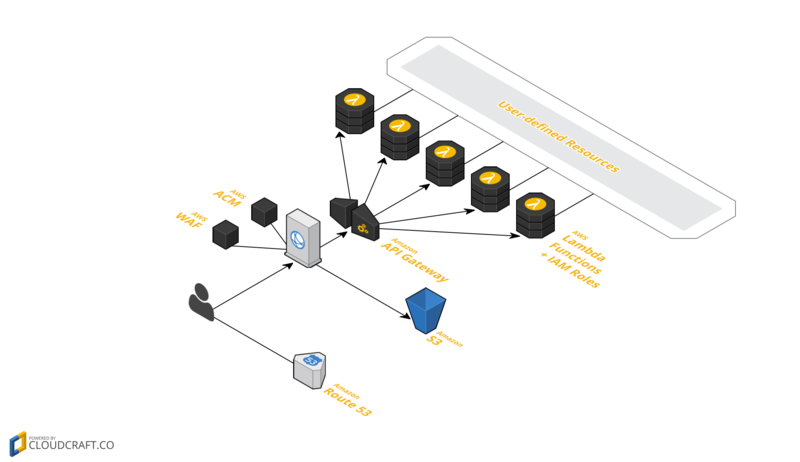 dawson lets you to deploy your serverless Node.js apps on Amazon Web Services. It requires no boilerplate, no init command and no configuration files. Just write your functions and deploy! Each function has its own IAM Execution Role, so you can define fine-graned IAM Policies. dawson offers first-class support for Single Page Applications: a CloudFront Distribution will be deployed in front of your app, correctly mapping assets and the API origin, so you don't have to worry about CORS. An AWS WAF WebACL can also be attached to CloudFront. dawson does not bundle your app with webpack, browserify or rollup, so you'll never have to deal with weird things. Your app's devDependencies are stripped out while deploying, keeping the bundle ZIP small. dawson uses pure CloudFormation templates, following the infrastructure-as-code principle; it requires no local or remote state files which may go out-of-sync or mistakenly be deleted. You can customize your app's template in every part, e.g. : you can add CloudFormation Resources, modify Properties of Resources created by dawson etc. As a free benefit, you get out-of-the-box support for multiple stages and regions. Finally, dawson will automatically support HTTPS for custom domains thanks to AWS ACM. Also, if you use Route53 your DNS Zone can be automatically updated. Using the dawson command you can deploy the infrastructure, inspect logs (in real time, like tail -f) and spin up a full development server so you can run your all locally in an environment will be almost identical to production's. The development server can also run functions locally in response to real AWS Events (S3 Events, DynamoDB Triggers etc.). A changelog is maintained in the Releases page. We are currently testing and targeting 100% coverage for functions that are involved in the template generation (src/factories/**.js).